Awww, in these two episodes, Sun Yu develops her own nickname for Ji Suk. Granted, it’s not the most flattering, but neither is his necessarily for her. She’s Double Kicker and he’s Mr. Liar. Ji Suk can be the one to keep her head on straight so she doesn’t keep forgetting everything and she can beat people up for him, lol. So the doggy attacks and Ji Suk and Sun Yu do their best to keep the canine off of them. The dog then bites Sun Yu and Ji Suk tosses his shoe away and off runs the dog. Sun Yu crouches and looks at the bite. It’s not that bad and there isn’t a lot of blood. Ji Suk is seriously worried and offers to piggyback her (of course). Sun Yu assures him she can walk, but when she tries to stand, she can only gasp in pain. Ji Suk crouches down and tells her to hurry and get on. She awkwardly does and keeps insisting she can walk while he tells her to be quiet. She then notices he’s walking with only one shoe and mentions this, but he doesn’t care. The only worry is to get her to the nearest hospital because what should happen if that dog has rabies? Sun Yu gets patched up and Ji Suk comes into the room and says he has heard from the dog’s owner and they are in luck as the dog is current on all of its shots. The two then go back and forth. Ji Suk once again apologizes for his lies (the compass, the ribs, and the ankle). He had his reasons and he knows he was wrong. Thus the two come to acknowledge each other as Double Kicker and Mr. Liar. It’s cute. Tae Mi comes home after staying out all night clubbing. She is worried that Dal Nyeo sat up all night because of her. She immediately apologizes to her mother and promises to never do such a thing again, but that’s not what’s got Dal Nyeo in her empty stare state. She explains what happened with Aran and Tae Mi is shocked that her mother went through an episode of a drama with the mother trying to buy her off. Dal Nyeo stayed up all night, but she has decided to place all her bets on this—returning the money. I’m impressed. Although we all know her real motive is to discredit Aran and get Ji Hee and Jung Soon on her side, returning the money is the right thing. So Dal Nyeo hops on over to the Seo house where Aran is shocked to see her. Dal Nyeo puts on a grand scene which angered Jung Soon and upset Ji Hee. Dal Nyeo plays the injured party not being able to sell off her son even though she’s a rotten mother. Tae Jung’s only sin was he was born to her. Um…no. His major sin is that he’s a devil masquerading as a human. I’d like to know what caused him to snap from the decent guy from Sun Yu’s and Jin Yu’s flashbacks to the power hungry social climbing heartless SOB. Aran is such an idiot. She tries to keep everything from her mother-in-law. Jung Soon is NOT stupid by any means. She chides Aran for making matters worse instead of better. Aran does apologize as she really didn’t think Dal Nyeo would pull such a stunt. Meanwhile, Ji Hee deeply apologizes to Dal Nyeo as she sees her out and then yells at her mother before returning angrily upstairs. Later, Jung Soon’s assistant brings her news of Ji Suk’s whereabouts at long last. As Ji Suk and Sun Yu return to the convent, his grandmother pulls up beside him. The two go to an empty field and Jung Soon scolds her grandson for pursuing his mother after all of these years. Ji Suk says only after he discovers his roots can he grow strong and figure out what to do with his life. His grandmother says she is the only one who knows everything and will willingly tell him—as long as he goes back home like a good boy. Sun Yu returns to the convent where the head nun scolds her severely and tells her that she had best get out. Sun Yu reminds her she is taking vows in only two weeks, but the head nun wants her out before she takes him as it is obvious that Sun Yu is not cut out to be a nun. Ji Suk hears this as he walks up and immediately jumps to Sun Yu’s defense as most of the head nun’s gripes had to do with him. The head nun still doesn’t believe Sun Yu is meant to be a nun, but Ji Suk goes on and on about how she helped him and saved his life (from a dog). The head nun then says that since he has the strength to jump to Sun Yu’s defense, he has the strength to leave. Harsh. At L Foods, Ji Hee apologizes to Tae Jung and gives him the famous drama back hug because he must be smarting with the latest incident. Of course, Tae Jung has no idea what she’s talking about and when he finds out, he’s not happy to know about the little scene his mother enacted. Ji Hee is also not happy by how low her mother stooped. Ji Hee then reveals her mother’s obsession with her all thanks to the arrival of her oppa Ji Suk. However, things are looking up for the couple. Tae Jung has successfully contacted the woman from America and re-set up the deal. Aran meets with him and he hands over the deal and says that while he orchestrated it, all credit will be going to Ji Hee. He will make sure that Ji Hee is the successor for L Foods and not Ji Suk. Aran does not like his audacity…but at the same time you know she’ll have no problem joining forces with him if he can really raise Ji Hee up. Poong Ho and Bong Hwang leave Jin Yu and Bong Hwang scolds him for insisting Jin Yu move in with them as she is bound to be uncomfortable living in the same neighborhood as Dal Nyeo. This gives Poong Ho an idea and he runs off to get a taxi back to their home. He bursts in on Dal Nyeo and begs her to save his niece. Dal Nyeo is flustered. Just what is going on. She is horrified to hear that Jin Yu is pregnant b Tae Jung. Dal Nyeo promises nothing as she and her daughter are both in shock by this news. You know that she will talk to her son and get to the bottom of everything. Ji Suk has packed up his things and sits waiting outside for Sun Yu to say goodbye. Why isn’t she coming? Young Ji then comes up and asks about his promise to get her a job. Ji Suk says he’s employing her from that moment on and his first order of business is for her to bring Sun Yu to him. So Young Ji goes to Sun Yu’s room where she’s packing. She’ll be spending her last two weeks as a novice in a different convent in seclusion. Eek. Anywho, Young Ji goes and tells her someone is looking for her. Sun Yu is surprised that it is Ji Suk. He asks about the outcome and when Sun Yu says he’s leaving, he immediately badmouths the head nun for being coldhearted. Sun Yu then breaks into her sunny smile and says that thanks to him, she has not been kicked out. This relieves Ji Suk. As Ji Suk walks away, Sun Yu notices he’s still wearing slippers. She calls out to him and then takes him to a shoe store where she buys him a pair of sneakers. Ji Suk is happy and very touched, but can the she afford them? Yes, she can, better than he can at the moment. After they leave the shop, Sun Yu instructs him to head straight home and not to get lost. She then asks for his compass. He takes it out and opens it. When he keeps moving his hand, Sun Yu tells him to be still. She then cups his hands in her own to steady them. The needle stops shaking. Whenever he’s feeling stressed and lost, he needs to remember that all he needs to do is stand still and the compass will point in the direction he should go. Awww. Our very sweet moment is ruined by more of Tae Jung’s inhumanity. He tells mommy dearest that Jin Yu’s baby is not his own. Kids grow up without father’s all the time and he doesn’t care for the girl or the baby. She promises to stay out of his life and he will hold her to that promise. Dal Nyeo is worried that Jin Yu might pop up out of the woodwork later and demand he claim his child, but again, Tae Jung insists he will take care of things so that doesn’t happen. Okay, back to some warm fuzzies for a very brief moment. 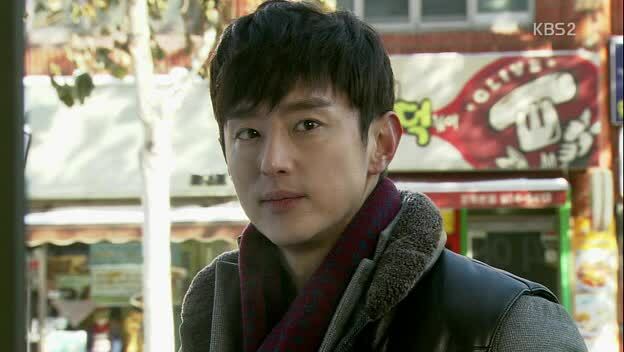 Tae Jung is happily recalling Sun Yu’s hands on his when he passes by a store. He stops and looks into the window. He recalls Sun Yu’s rough hands and goes in. Awww. And again, the warm and fluffy moment is ruined by Tae Jung who has come with a paper for Sun Yu. What paper is it? It’s a document relinquishing all paternal rights. Sun Yu doesn’t wish to accept it and Tae Jung says if she won’t, he’ll give it to her eonni himself. Enter Ji Suk who witnesses the scene (but, of course, can’t hear what is transpiring). I can’t believe Sun Yu actually got down on her hands and knees to beg that trash to stop hurting her sister and do the right thing. We all know he won’t.